Keeping you WH&S compliant so your workers stay safe. Charged at one, all-inclusive annual fee – that’s it! No matter your business’s unique needs, Alsco takes care of every detail with our serviced rental service. This is our guarantee. Learn why renting vs buying is better for your business. Once your kits are installed – put all thoughts of WH&S legislation, maintenance, and staff safety out of your head completely. Our comprehensive rental service takes care of it all. 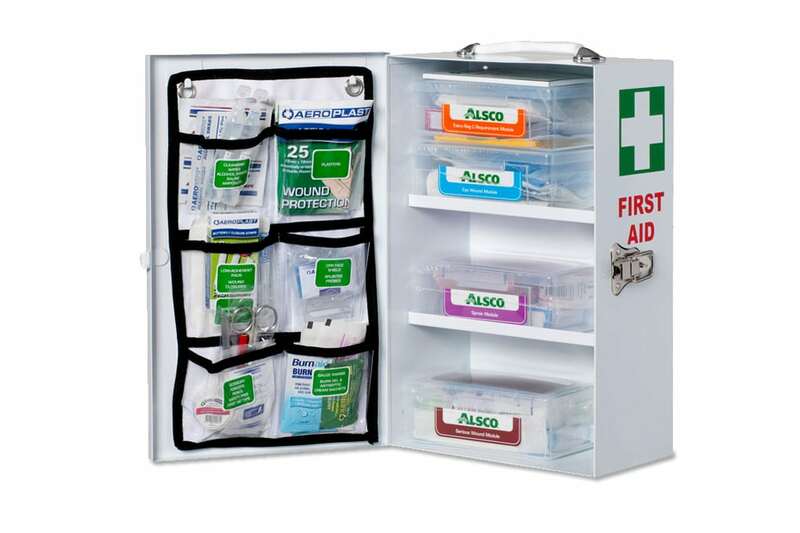 With our ‘Regular Cabinet’ first aid kit, your business will be prepared for nearly every injury – no matter your industry. With our fixed-rate rental plan, you don’t have to worry about replacing stock or keeping up-to-date with complex WH&S regulations. Our professional, quarterly checks will keep you covered year-round. 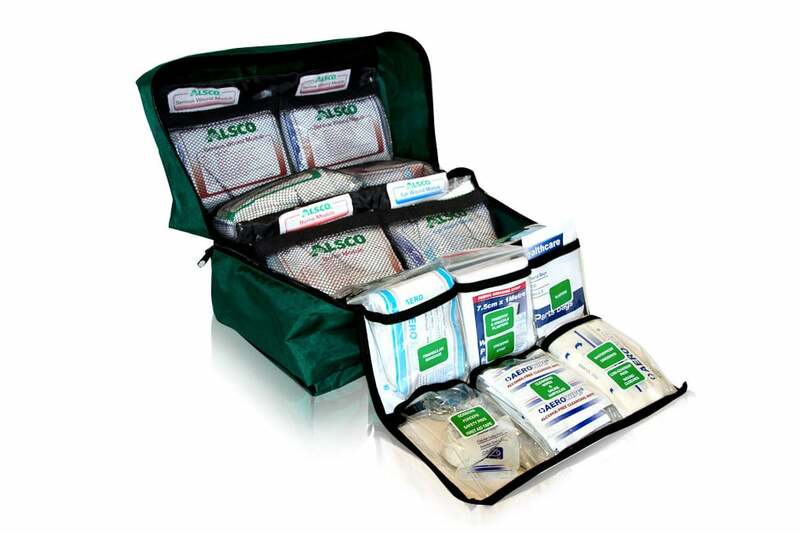 Specifically designed for the food and beverage industry, this first aid kit is ideal for restaurants, bars, hotels and cafes. 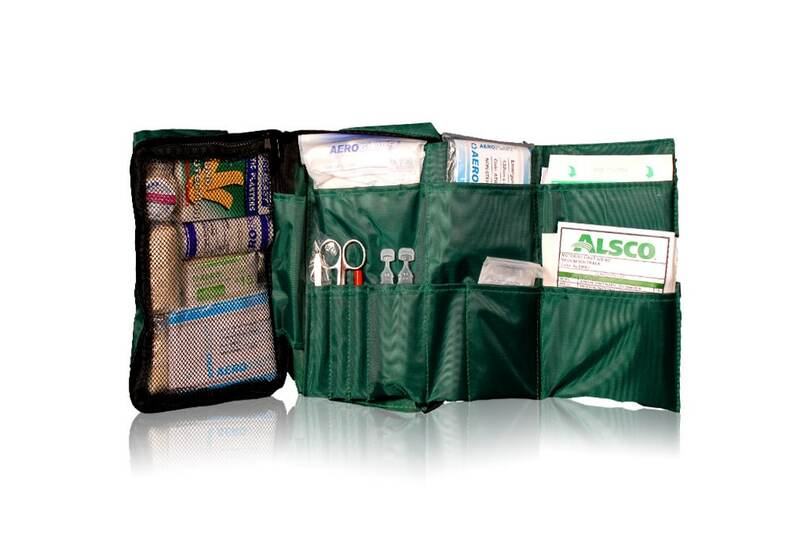 With our fixed-rate rental plan, you’ll never need to wonder whether your first aid kit is up-to-date and WHS compliant. Our professional, quarterly checks will keep you covered year-round. 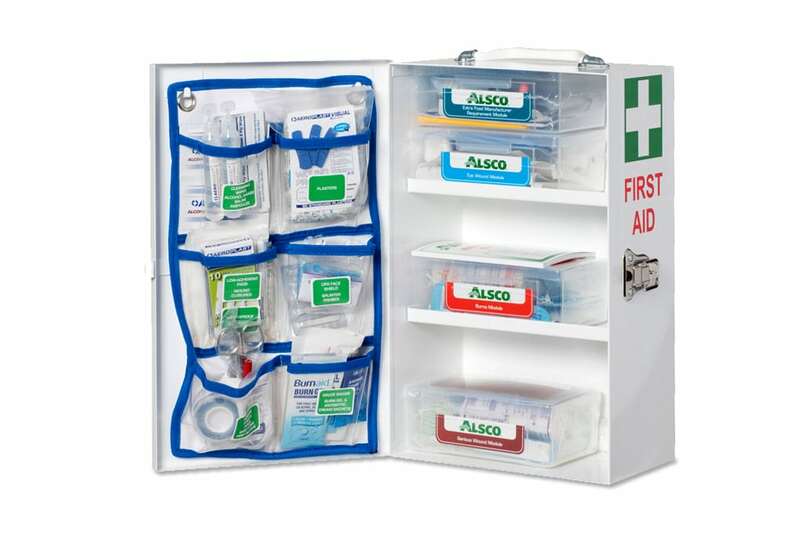 Suitable for smaller workplaces, this convenient first aid kit still comes with regular, quarterly servicing with one, fixed annual cost. You don’t have to worry about replacing stock or keeping up-to-date with complex WH&S regulations. Our regular, professional checks will keep you covered year-round. 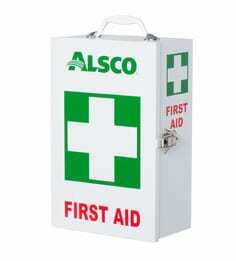 Specifically designed for cafes, restaurants, catering, food stalls, this compact food industry first aid kit is a convenient size. 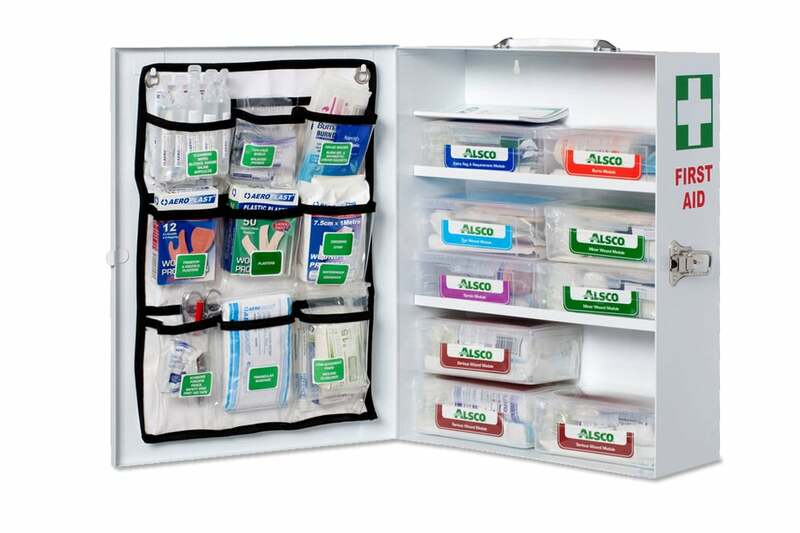 Easily mounted on the wall in a robust, highly visible metal cabinet, your staff will have speedy access to first aid supplies as they need them. For those on the move, this soft-sided pouch is easily tucked away in the glove compartment, under the seat or in the boot cabinet of fleet cars and trucks. 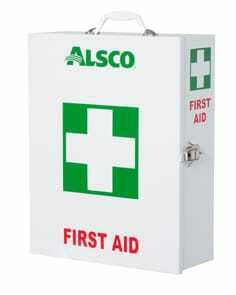 Every employee, especially remote workers, need fast, reliable access to first aid. Make sure your staff are covered – wherever they are. 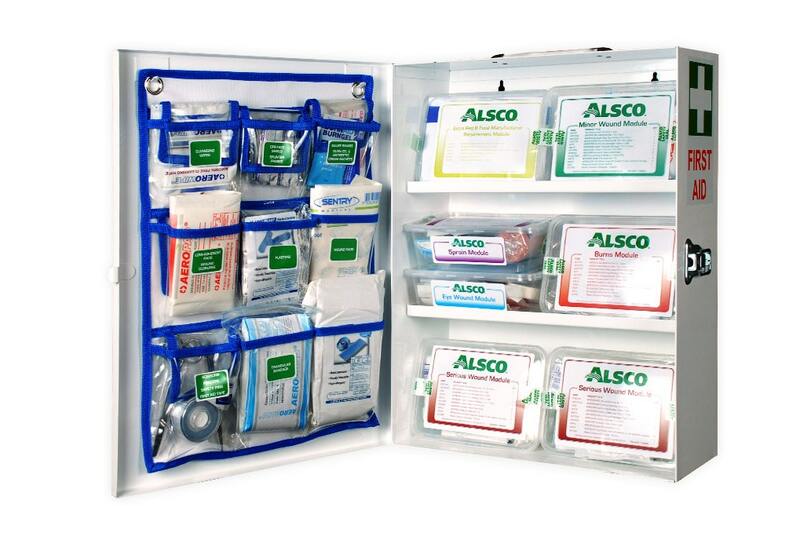 Ready to pay a single fee – and let Alsco take care of your first aid kit needs year-round? Act now! Call 1300 077 391 or use our contact form above to get the best price quote! Buying isn’t always the best idea for your business. Buying means a large cash investment, complying with complex WHS regulations, and continually having to keep your equipment maintained and up-to-date. Sound like a hassle? It is. That’s exactly why we created our Managed Rental Service. 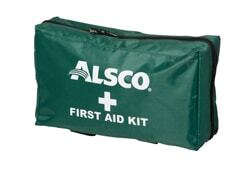 Renting with Alsco is more than just renting. We handle everything. From regular, professional maintenance through to WHS checks and each detail in between, Alsco is determined to make your rental experience smooth, seamless, and stress-free. Your business is unique. But your cashflow concerns aren’t. 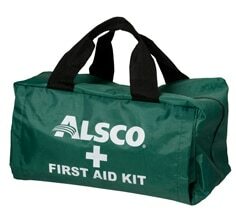 With Alsco, you pay a fixed fee. You’ll benefit from clockwork delivery, free replacements, and emergency, on-demand servicing. One fee – limitless help and support. Because that’s how it should be. TAILORED TO YOUR BUSINESS Have unique requirements? One-off emergency requests? Need to quickly adjust your service? You say jump…we’ll say ‘how high?’. COMPLIANT WITH COMPLEX WHS LAWS Avoid government fines of up to $3,000,000, and let Alsco keep your business up-to-date and legally-compliant. REGULAR PROFESSIONAL SERVICING Serviced and delivered on time – every time. Our teams will help keep your business clean, organised and professional. CASHFLOW FRIENDLY Avoid large, crippling purchase fees, and pay a fixed fee. Take advantage of our all-inclusive service. DECADES OF EXPERIENCE Founded in 1889, Alsco’s rental service has been carefully honed and perfected to your industry over 125 years.